Having an excessively loud computer can really detract from the gaming experience. Hearing a loud noise while you are enjoying a game can be very irritating. Thankfully, there are several measures you can take to prevent loud computer noise. The easiest way to reduce computer noise is to purchase case fans with a low decibel (dB) rating. 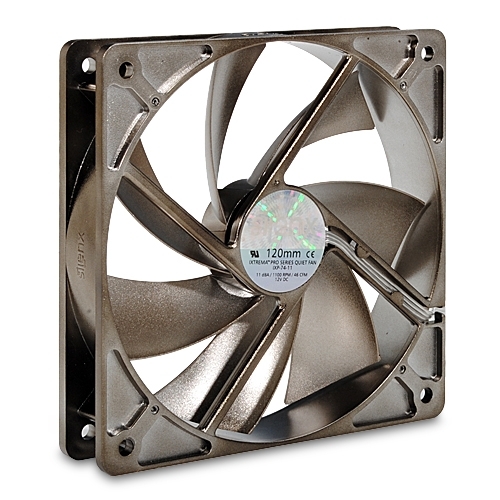 I recommend using fans with a rating of 15 dB or less. If you use several of these to replace their louder counterparts, you will see a dramatic decrease in the noise level from your computer. The Silenx IXP7409 iXtrema Pro 120mm fan and the the 80 mm version are top of the line products, featuring a very low dB rating. Best yet, these fans still move plenty of air with a cubic feet per minute (CFM) flow rating of over 30. Replacing the computer case fans is easily done and a great step to reducing computer noise. Please see the case fan installation guide for more information. Another great way to keep your computer's noise down is to swap in a quiet CPU fan. Surprisingly, CPU fans can be quite loud as well especially during times of peak performance. One of the highest rated CPU fan manufacturers is Zalman. They produce several high quality processor fans and are very pleasant on the ears. Just be mindful of your CPU socket type and purchase a fan that is compatible. The Zalman CNPS8000A Multi-Socket CPU fan is a great choice. With a very nice price tag, this fan will keep your computer's processor plenty cool without all the noise. Another viable option for computer noise reduction is using liquid cooling. Essentially replacing all the fans, liquid cooling is more expensive than using fans, however, it produces much less noise. Liquid cooling involves three main components; a hollow metal block to sit on the CPU, a pump to move the liquid, and a device to cool the liquid. The only real noise produced comes from the sound of the pump or radiator.